A Customizable Cell Phone Clip That Fits Any Phone or Device. Add your company logo, your favorite sports team, or a picture of friends or family. 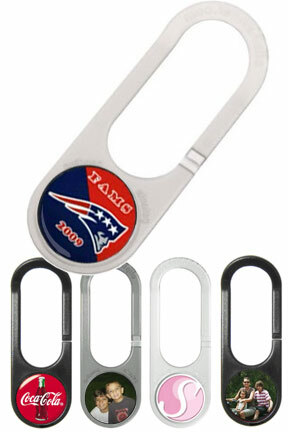 The possibilities are endless with this great universal clip. Use it as a company branding item, or give it to a loved one as a gift with the picture already inserted. This ClipHanger is identical to the original ClipHanger, but the center button is totally customizable. Simply cut any image to size and insert into the clip. Place the protective cover over the top, and you are all set to install it on your phone, pda, ipod or virtually any other mp3 player or small electronic device. The ClipHanger has always been the easiest way to hold your phone at an easy reach, but now it can be totally custom too. Change the picture as often as you like quickly and easily. Now whenever your mood changes you can give your clip a new look. For a totally unique and personalized look for your phone choose the ClipHanger Pic. Cliphanger lets you hang your cell phone or music player anywhere. Your device stays nicely tucked aside, but handy for answering incoming calls or checking the time. It will conveniently hang on your purse, the dashboard, your belt loop, the desk in your office and more. It is a universal clip, and will fit most phones or other portable devices. Basically, if your device has a flat, sturdy back/battery door, then it should fit and work well. Stop searching for the perfect carrier for your specific model of phone. The ClipHanger is perfect for any model. Unlike typical product cases that add bulk and wear-out with use, this compact, sturdy tool hangs on lightly but securely. This cell phone holder is designed to solve the most common problems people have with their phones. Most ladies keep their phone in their purse. By the time they are able to find it they miss the call. The clip hanger easily hooks onto the strap of your purse, so it is easily accessed. Guys can hook it right on their belt loop which eliminates the need for those cases that are forever attached to your waist. The hook and your phone are one, but it doesn't really get any more bulky. It moves with your body so it will not snap off and break. This high quality, durable clip comes with a full one year warranty. Hang your phone from the simplest yet most convenient places. When you order the totally customizable ClipHanger Pic you are getting the ultimate personalized cell phone holder. Order Yours Today! ClipHanger Pic - A Personalized Mobile Phone Holder - Virtually unbreakable. Just stick, clip and hang. This innovative cell phone holder fits on any mobile device and is convenient and easy to use. It won't come off until you want it to. A hanger and a clip in one.